"You know what you just did?" Let's just get one thing clear right from the start: The Asylum does not make good movies. I love them and I'm so glad to be back reviewing a new release of theirs after my short but sweet stint binge-watching their films from March to August this summer, but there's nothing that accurately describes the entirety of their filmography better than the word "bad". This happens for a lot of reasons, the primary of which is that they don't spend any time or money on their productions. Whatever the cause it's an essential fact of their existence, and one which is easy to forget with the recent widespread popularity of Sharknado and its new sequel. So before we move on, it's important to know that if you go into an Asylum movie expecting anything that actually resembles modern cinema and you will only be disappointed. Alright, are we all on the same page now? Great. Then let's talk about how amazing Sharknado 2 is. The film opens with a shot of an airplane tail fin "swimming" through clouds, an explicit homage to Airplane's homage to Jaws. This reference to something which was already a reference to something else perfectly embodies exactly how derivative and schlocky the rest of the movie is going to be. It is basically a collection of "movie moments" taken wholesale out of screenwriters' reject bins and filled with dialogue straight from a book of secondhand "movie lines". It's filled with aural and visual nods to previous films (Star Wars, Independence Day, and Back to the Future to name a few) but without even the bare minimum added substance of the Scary Movie, "Ha ha, we took that from another movie" joke. I realize this doesn't exactly sound like praise, but it's all part of the film's careful and meticulous plan to make you laugh hysterically at it. 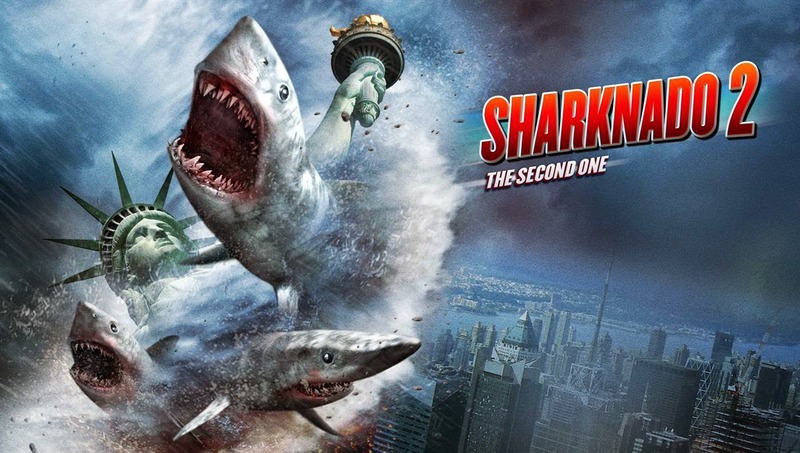 So what exactly makes Sharknado 2: The Second One worth watching? The easiest answer is its wild and unruly attitude. It is an absolutely rambunctious film. It works best when it's doing its own uniquely silly stuff, like killing a shark by stabbing it with a kitchen knife and batting it into a pizza oven. Ian Ziering returns as Fin Shepard and has an excellent time playing the hammy, melodramatic, Bruce Campbell-esque superhero. And as has been pointed out endlessly elsewhere, there are a plethora of delicious cameos, from Judd Hirsch as the stereotypical New York City cab driver, to Jared from Subway as Jared from Subway (eating Subway on the subway), to a wide variety of TV news personalities as themselves. But it's not all fun and games—and that's the film's only real problem. While it definitely ups the ante in the editing and cinematography departments (including things like psychological jump cuts & choreographed camera movements), it's still impossible to take seriously on any level, and this becomes an issue when the film tries to do serious dramatic stuff. The biggest offender here is a forced love triangle created by the addition of Vivica Fox as a lost love from Fin's past, a role which succeeds only in being annoying. There are a few other hiccups, like Tara Reid saving a young child from being abandoned in a hospital, and the film generally flounders the farther it strays from its "killing sharks with chainsaws" shtick. However, there are plenty of memorable moments when the film finds its groove, and as long as you go in with the right sort of expectations it's easy to have fun with. For a movie that would easily be the worst thing an average person might see this year, there's still plenty to like about Sharknado 2. Just remember: it's not good. It's very, very bad. But that's the point. The film also shows disconcerting signs of its commercialization and an unsettling abundance of product placement. When The Asylum succeeds it has nothing to do with money, so let's keep these movies lean and mean, shall we?